With four burns completed since Mars Orbit Insertion on Sept. 21st, ‪#‎MAVEN‬ is now in a 4.6 hour orbit with a periapsis (closest approach to Mars) of ~175 km. 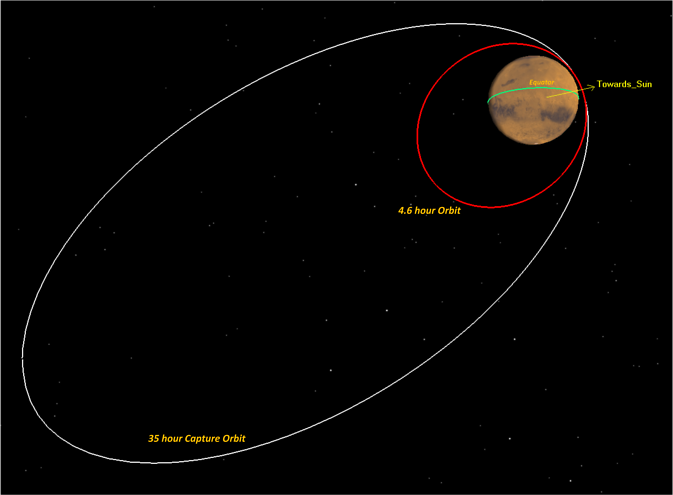 In MAVEN’s current orbit, Mars’ atmospheric density is 0.04 kg/km³, which is just outside the required density corridor for the primary science phase. The current orbit places the spacecraft into what is referred to as an “occultation zone” with respect to the arrival of Comet Siding Spring’s dust cloud on Sunday, Oct. 19th. Despite the unique science opportunity presented by the close encounter with an Oort Cloud comet, the safety of the spacecraft at ‪#‎Mars‬ remains top priority. All of NASA’s Mars orbiters have made adjustments to their orbits and spacecraft orientation to minimize any potential risk. Two Periapsis Lowering Maneuvers (PLMs) planned over next two weeks will lower MAVEN’s periapsis to 150 km and place the spacecraft within the required science density corridor of 0.05 kg/km³ to 0.15 kg/km³.